The music of Igor Stravinsky takes over Walt Disney Concert Hall for three different sets of programs over the next two weekends, led by one of its most ardent advocates, Esa-Pekka Salonen, and played by one of its best orchestral interpreters, the Los Angeles Philharmonic along with the Los Angeles Master Chorale and various other guests. I, for one, could not be happier, and I’m sure I’m not the only one. Too much Stravinsky is never enough. Which reminds me of a great bit of Stravinsky-related trivia I learned last year . . . While the esteemed composer lived more of his life in Los Angeles than any other city in the world, he’s best known as a citizen of the world and a musical polyglot. But I doubt even he would have predicted the breadth of musical genres his influence would pervade 100+ years after his birth. And no, I’m not just talking about neoclassicism, 12-tone serialism, or even jazz. I mean New Wave, R&B, pop, rock, and Hip Hop. 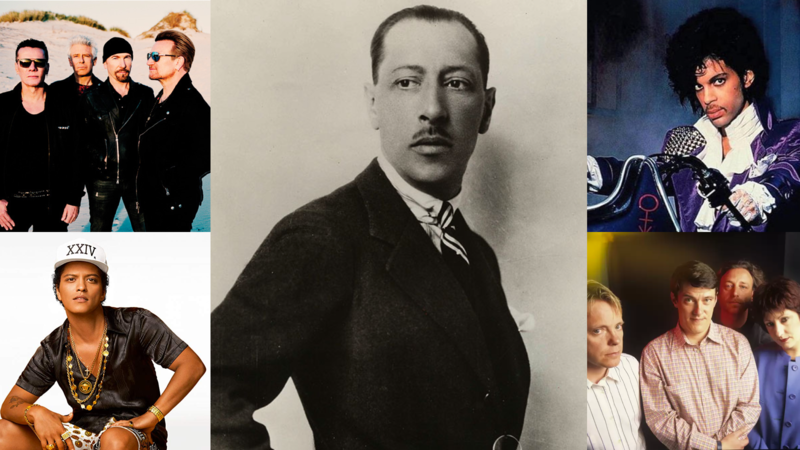 The number of times the “Infernal Dance” from Stravinsky’s Firebird has been quoted by the Western World’s most popular musicians is astounding. You’ve certainly heard it within songs by such an unlikely collection of acts as Michael Jackson, U2, Prince, New Order, Britney Spears, NWA, The Backstreet Boys, Afrika Bambaata, The Smiths, Jennifer Lopez, and on and on . . .
And I’m betting that even if you’re the most devoted of Stravinsky fans, you probably never realized it. Don’t believe me? Not sure what I’m talking about? Read this academic article from the journal, Popular Music: “The Story of ORCH5, or, the Classical Ghost in the Hip-Hop Machine” written by Robert Fink of the UCLA Herb Alpert School of Music. Or if you prefer not to get all ivory-towery, just watch the excellent video below. Tags: Bruno Mars, Esa-Pekka Salonen, Michael jackson, New Order, NWA, Prince, Robert Fink, Stravinsky, U2. Bookmark the permalink.